Behind the sublime pleasures of a Mr. Steam steambath are many years of research and development combined with an uncompromising commitment to quality materials and precision manufacturing. Each component in the Mr. Steam steamboat system has unique features that guarantee a consistently enjoyable and rewarding steam bathing experience. Any shower, tub or enclosure can become a personal steamroom. Mr. Steam steam bath generators are compact, easy to install and fit within a cabinet, closet, vanity, basement or heated attic. Stainless steel design inside and out provides long lasting strength and durability. Beautifully designed in-shower digital controls are a standard feature, available in today’s most popular finishes. Wireless infrared remote available for in-shower use. All models are UL/CSA/CE listed. Available Autoflush keeps the generator dry between uses. The generator can be located up to 25 feet from the steam room. All generators are complete with a stainless steel tank sand equipped standard with a manual drain valve. All control connections are made with “plug-and-play” connections. Each unit has replaceable, industrial grade (not appliance grade) elements. Mr. 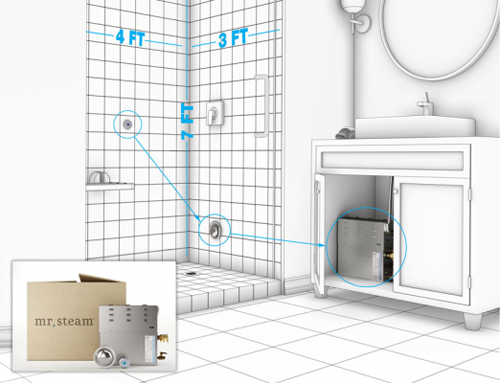 Steam aroma steamed distributes aromatherapy oils and steam with the steam/shower enclosure.